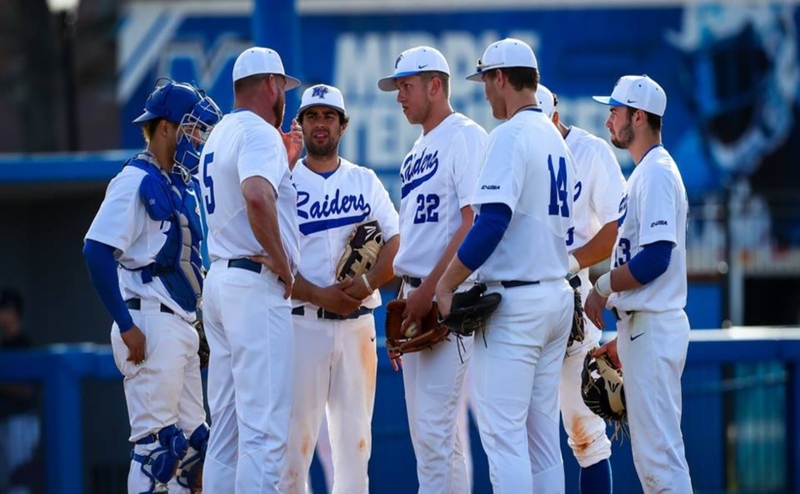 The Middle Tennessee Blue Raider baseball team finished up “fall ball” with the Blue-White World Series on Wednesday. The white team took the series four games to one and they won the final game on Wednesday by a score of 8-5. After making improvements over the fall, MTSU worked to get even better after last season and the newcomers had a chance to build chemistry on the field with their new teammates. Below, the Sidelines team breaks down each position group’s fall performance. Arguably the team’s biggest loss from this past year was shortstop Riley Delgado, who graduated and was drafted by the Atlanta Braves. The hole left by Delgado seemed to be the most glaring and the biggest to fill. The Blue Raiders hope that Nashville native LA Woodard is primed to fill the void. Woodard hit .372 and stole 25 bases last season for Kansas City Community College. Based on his play this fall, he looks to do the same for the Raiders. 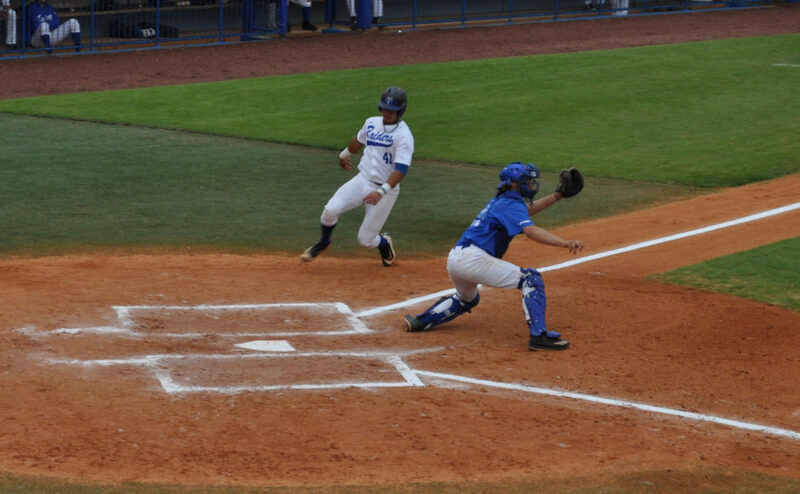 Woodard hit .200, scored four runs and stole four bases during the Blue-White World Series. After having an offseason surgery, Ryan Kemp wasn’t cleared to hit much during the fall, but got work in defensively at second base and in the outfield. The former Columbia State Charger led the Raiders with a .366 average and doubles with 16 last season. Kemp also hit eight home runs, good for second on the team, and scored 39 runs last season. In the hot corner, Drew Huff will be back for his junior campaign. The Riverdale High School alum made huge strides in his sophomore campaign, hitting over .300 and collecting the second-most teams hits with 65. The third baseman put together a productive Blue-White World Series, hitting .300 with one home run while also getting some work in on the mound. 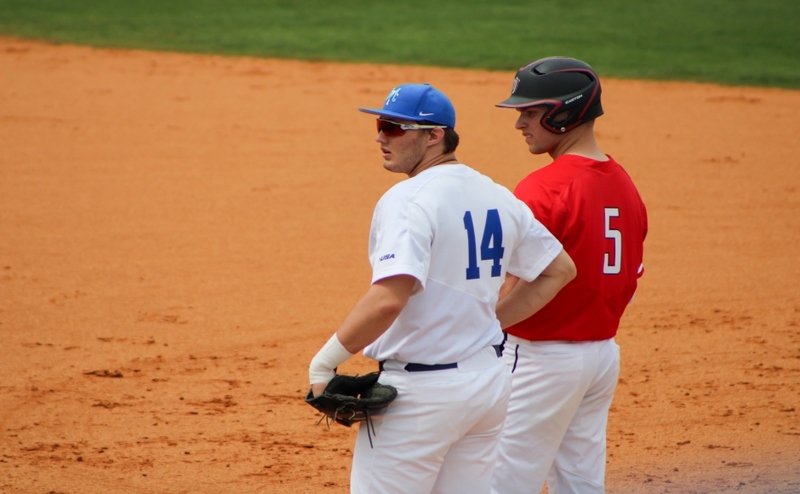 Though Kaleb King was lost to graduation, the Blue Raiders still have depth at first base. Former starter, Kevin Dupree, will return from injury this season. The fifth-year senior has slimmed down and can now play the outfield as well, and is arguably the team’s best defensive option at first base. As one of the few left-handed batters on the team, expect Dupree to be a situational starter/pinch-hitter for MTSU this season. Newcomer Brett Stratinsky stretches to make a play at first base in the Blue-White World Series in Murfreesboro, TN on November 1, 2017 (Anthony Fiorella/MTSU Sidelines). As far as the everyday duties, newcomer Brett Stratinsky will likely takeover the job. Stratinsky has proven he can hit with power in the past. In his two seasons with McHenry County College, Stratinsky’s 27 dingers set the school record for home runs. The Illinois native has taken a liking to Reese Smith Field this fall, hitting .416 during the Blue-White World Series. Doing the designated hitting should be senior Aaron Aucker. Aucker will compliment Stratinsky’s power with some of his own. The Knoxville native led MTSU in both main power categories with ten home runs and a .641 slugging percentage. Possibly the most wide-open position battle on the team will take place behind home plate. The only catcher that logged playing time last season is sophomore Aaron Antonini. Antonini hits well for a catcher and continued to do so this fall by hitting .363 with one home run and two runs batted in (RBIs) during the Blue-White World Series. Another player returning for a fifth year after battling an injury is Will Schnure. Schnure’s experience behind the plate is what sets him apart, having caught 50 games in his career. The Georgia native hasn’t been able to make the long throw to second over the fall due to season-ending shoulder surgery after a game against Georgia Southern last season. During the Blue-White World Series, Schnure appeared as a DH and hit .272 with one home run and two RBIs. Murfreesboro native Alex Carignan is coming off of a redshirt year last season. Carignan caught for Carson Lester at Siegel High School and may see most of his action on days where Lester starts. Over the Blue-White World Series, Carignan proved his worth by hitting .500 and logging quality innings behind the dish. Freshman Jake Hagenow will be in the mix this upcoming season as well. Hagenow comes to Middle Tennessee from Farragut High School, where he was an all-state catcher. Like Antonini, Hagenow hits extremely well for a catcher. In his first experience against college pitching, Hagenow hit .300 and played error-free behind the plate. The biggest loss for the Blue Raiders at this position group is Brad Jarreau, who finished his career at MTSU placing in the top ten of several significant categories. This includes 128 games played (eighth all-time), and a perfect fielding percentage in center field with 108 career starts there. Newcomer Myles Christian is expected to help fill the void left by Brad Jarreau. He takes a swing in the box in the Blue-White World Series in Murfreesboro, TN on November 1, 2017 (Anthony Fiorella/MTSU Sidelines). Two key players to watch out for this season are Myles Christian and Manuel Lopez. The duo will battle it out for the vacated spot by Jarreau. Christian is a tremendous defender, winning the Rawlings Golden Glove Award his senior year of high school. He also handles the bat well, hitting .424 with eight home runs, and 11 doubles his senior year. During the Blue-White World Series, he hit .307 while playing all three outfield spots. Lopez saw some action last season, playing in 18 games and while starting in seven. He posted a .314 batting average and slugged .571 in 35 at-bats. Lopez will be a likely candidate for designated hitting this season due to his powerful bat, and will fit in best as a corner outfielder due to his strong arm. Lopez did go into a slump during the Blue-White World Series, as he only collected one hit in eight at-bats. Austin Dennis will be another player to watch out for. Dennis was a starter last year, starting in 53 0f 55 games. He ranked second in the nation with ten sacrifice flies, and led the team with 48 RBIs. During the Blue-White World Series, Dennis hit .333 and had two extra-base hits. Blake Benefield is also an expected starter for the Raiders, as he started 53 games in left field last season. He posted a .261 batting average with three home runs and 24 RBIs. He possesses a strong arm, and his speed in the outfield should improve with time and conditioning. During the Blue-White World Series, “Benny” hit .250 with one home run and three RBI. Phillip Kunsa will provide a good pinch-hitting option and can spell guys on their day off, and Darrell Freeman will fill a similar role. Freeman can be used as a pinch-running option as well. The Blue Raider pitching staff must replace the production of starting pitcher Cody Puckett this season. Last season, Puckett ranked second on the team in earned run average (ERA) and innings pitched, and led the team in strikeouts. Junior Carson Lester could step up to replace Puckett. Lester is a Murfreesboro product from Siegel High School. Coming out of high school, Lester was ranked as a Top 500 overall prospect and was the 21st best player in the state of Tennessee. During his sophomore campaign, Lester appeared 18 times, including six starts, on the bump. Despite consistent usage, Lester struggled with command in the 2017 season – evidenced by his 6.78 walks per nine innings pitched rate. With a strong showing in fall ball, Lester could crack the rotation as a weekend starter. In his lone Blue-White World Series start, Lester picked up the win in a game where he went five innings and gave up just one run. Freshman Peyton Wigginton enters this season as a lefty who could work himself into a significant role in the rotation. Wigginton was ranked as the 42nd best player in the state of Tennessee coming out of high school. Jake Wyrick is a returning senior for the Blue Raiders who will be pivotal to their success this season. 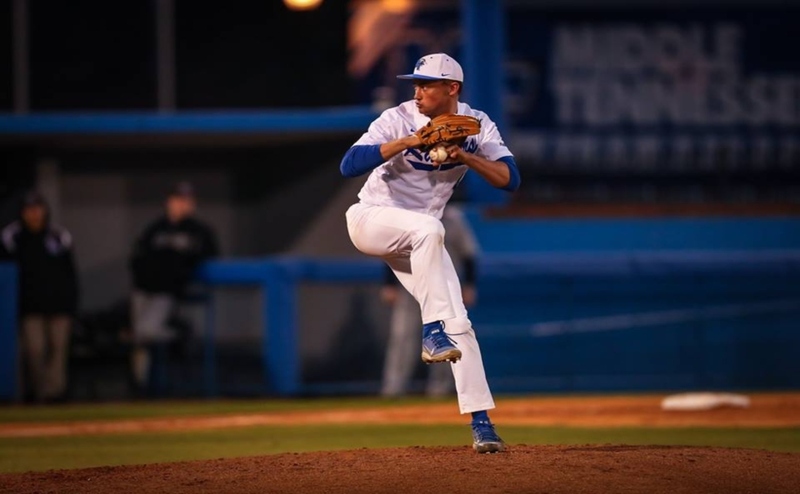 Presumably a weekend starter, Wyrick is a lefty who can create favorable matchups for MTSU. Although Wyrick struggled with handing out walks last season, he’s on a mission to correct that this season. Ryan Scharf winds up and fires a pitch in the Blue-White World Series in Murfreesboro, TN on November 1, 2017 (Anthony Fiorella/MTSU Sidelines). If Tyler Holcombe can remain healthy, look for him to be a guy that can contend to be the closer. Last season, third baseman Drew Huff actually did most of the closing pitching, posting a 3.63 ERA with an average of 10 k/9 and had a 1.05 WHIP. Newcomer Andy Wright is capable of logging some innings as a late-game reliever as well. As a whole, the Blue Raiders staff struggled with their command last season. They averaged almost six walks per game last season for a grand total of 309 on the season. 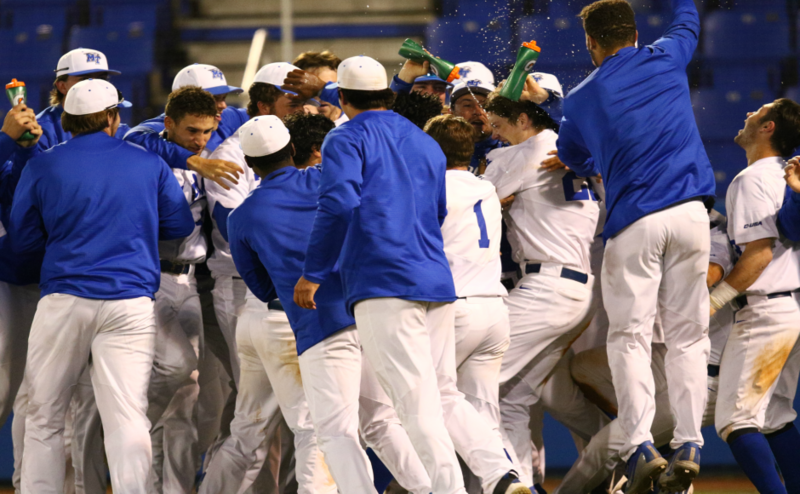 If the Blue Raiders can consistently throw strikes and command the strike zone under new pitching coach Caleb Longshore, they could be on their way to the conference tournament again this season. All statistics are as of Blue-White World Series game four. Follow MTSU sports reporters Anthony Fiorella @A_Fiorella74 , Timothy Carroll @TimCarrol95 and Calvin Smith @calvin_smith33 for more coverage. 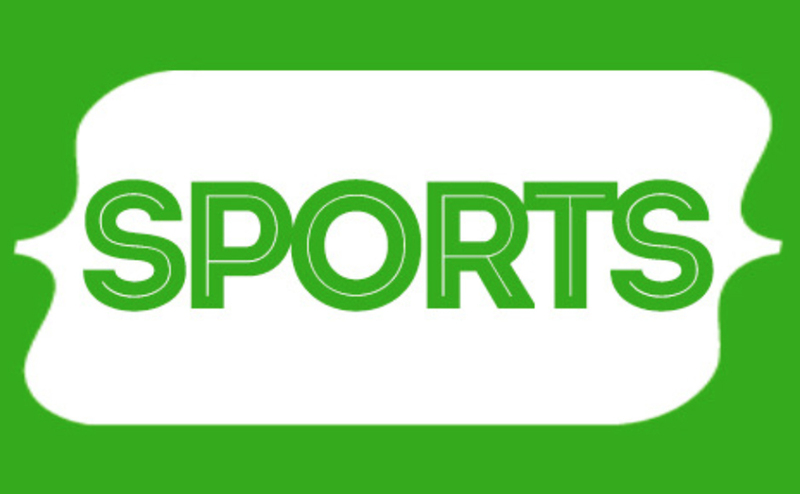 To contact Sports Editor Rusty Ellis @rustyellis13, email sports@mtsusidelines.com.